This gift tray has a length of about 14 in, a width of about 4.25 in and has a height of about 1.5 in. Cashews, Almonds, Pistachios, Peanut Oil and Salt. This gift tray is certified Kosher Pareve. This was a gift for my Mother and they said they were fresh and wonderful. It was a hit. Sent this to my son as a gift and it was delivered in a timely manner. My son was happy with the quality of the package and its contents. Sent this as a get well gift and received a BIG thankyou. The Superior Nut peanuts are my husband and my favorites. Felt like it was a premium gift for the holidays. Although I didn't eat or share any of this product, my father was very elated to get it, and has been quite happy with it. I had gotten nuts before for Christmas at the office, and always felt it was a nice gift to eat on during the holidays. This nut tray was a perfect gift for my brother and sister in law. I bought an assortment for my self. The product was fresh and made an attractive presentation with the gift basket. Very pleased with this product. Liked every thing about this product. Quality, packaging and price. gift arrived right on time! I can't speak to the quality of the product-it was a gift for my brother 8 hours away. But I know it arrived On Time and that is a big part of a "sent" gift. Great gift for Father's day! Arrived on time, wonderful customer service, very happy! Overall very satisfied with the ordering and product. The person that I called and ordered from was very helpful. The family that recieved the gift said it was good quaility. If I had one complaint it would be that it seemed like a small amount of product for the price. This selection was purchased as a gift. 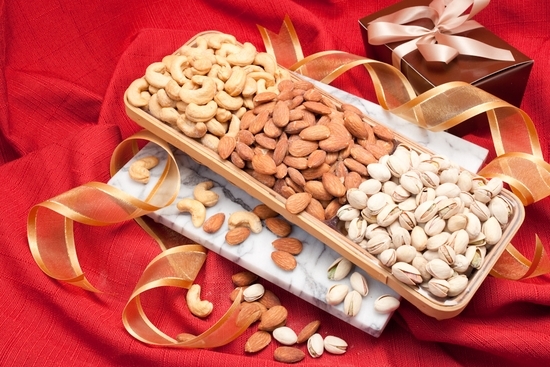 The person to whom the gift was given stated that the nuts were delicious. Neatly packaged and received in a timely fashion. I sent this as a gift. It arrived on time and the recipients thought it was great. They also commented on the nice basket. The price was reasonable and I liked the free shipping. I have purchased from your company several times and everything is fresh and delicious. Friends who have received the gifts have been very pleased. I've gotten the "executive tin" for myself several times and it's great. It's also nice to buy from a local company. Delicious fresh assortment. This makes an attractive gift. First time I have used Superior for a special occasion gift. The entire expericence couldn't have been any better. The ordering was easy, the prices were not shocking, the free shipping was outstanding! Recipient was very pleased with the gift, loved the idea of getting the nuts and said the taste was excellent. Will defintiely consider Superior Nuts on future gifts. Superior Trio Gift Tray Thank you. I sent this to a couple for helping me move my business. They loved this trio. Lots of great comments on the quality of the nuts.It was a gift the whole family enjoyed. I will defiantly order this again! The product was fresh and arrived timely. I purchased these nuts as a gift. I was satisfied with the service and quality of my order. The person they were sent to said they were very good and enjoyed. I sent this item as a gift (so I didn't see it byself.) But the recipients loved it!!! I bought this for a gift, recipient was was pleased. Purchased the nut tray for a gift. Feedback was that the nuts were very good. I may order some for myself in the future. They arrived as described and right on time.